The other day, I was having an email conversation with my friend Marty. I mentioned that I had seen Taxi Driver over the weekend. And that prompted Marty to tell me a small story about his relationship with that particular movie. “I was working on a huge art project when I was in college,” he said. Marty is now an award-winning graphic designer and art director. “It was a 10-part drawing series that had to do with crime. I was given the subject matter of a guy who robbed a liquor store, killed the clerk and was then given the death penalty,” he continued. 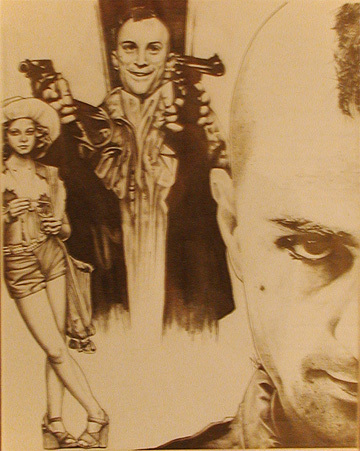 The Taxi Driver drawing hanging on Marty's wall. There are a lot of things I love about that story. First of all, it’s great that an educator found a way to reach his student. Second, he reached his student using cinema. Most importantly–the reason I’m writing this article–is that it inspired a deep appreciation for a single film. That really resonates, because I think it’s true of a lot of people. Admittedly, thirty times is a lot of times to see a movie in a lifetime. It’s an even wilder feat to accomplish in a few years. Still, anyone can relate. Our favorite movies are visual comfort food. 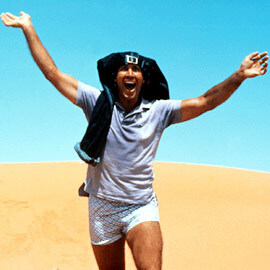 I have witnessed a parched, insane Clark Griswold more times than I can count. We all have those movies we turn to again and again at certain times. We do it because we’re bored, or because we want to be inspired, or we want to laugh, or we need a pick-me-up, or we need to stir our creativity. There are countless reasons for the phenomenon. Before you know it, you’ve been alive for 20 or 30 years and you’ve seen a certain film five, or ten, even fifteen or more times. One of my other friends–the guy who met Kevin Meaney–has seen The Blues Brothers more times than he could count. For another one of my friends, it’s 2001: A Space Odyssey, initially sparked because he wanted to have a full understanding of it. When I was a kid, it was National Lampoon’s Vacation. In my late teens and throughout my 20s, it was Animal House and The Big Lebowski. Now in my 30s, it’s become Hot Fuzz. I couldn’t begin to estimate how many times I’ve seen those movies, and I’m sure I’ll see them countless times more in the future. They fit me like a warm blanket. Hearing other people recount their own tales proves that it’s not a unique phenomenon, and it adds a really fantastic dimension to cinema. Like our own DNA, certain films have an engaging quality that fits individuals in their own special way. It moves us to embrace them for a lifetime the way we might embrace a pet. What films have you seen countless times? Oh, man, I have dozens of films I watch over and over. I just can’t help it, they’re all so brilliant. Some of my great rewatchers are Stranger than Paradise (the best movie of the 80s), Werckmeister Harmonies (my favourite film), Code Unknown (a Michael Haneke film I’m writing a book on), Napoleon (the greatest silent film of all time), Inland Empire (a Lynch masterwork that I just have to see again and again), and of course the more popular films like The Big Lebowski (which I actually saw for the fourteenth time on this very day), Goodfellas, The Seventh Seal, Clerks, Dr. Strangelove (I don’t know how many times I’ve seen this one but it has to be more than 30), Blazing Saddles, See No Evil Hear No Evil (a Pryor-Wilder classic) and many more. While we’re on this subject, there is a TV show made in the UK in the 70s and 80s that only churned out 12 episodes before finishing, but is in my opinion the best TV show of all time, and – this is no exaggeration – I have seen the entire series more than 100 times. It just NEVER gets old. The series is called Fawlty Towers, and it stars John Cleese. If you ever come across it, give it a chance. It is the most hilarious thing I’ve ever seen in my entire life. Tyler – I love that WH is your favorite film. I love it too and can’t explain why. I am not the best re-watcher, but I certainly have seen Shaun of the Dead… many time s and I still laugh like it was my first time!! The one part of that movie I always want to catch is the opening credits- with that “I Monster” song playing and the future zombies all walking around just like zombies… before they’re zombies. I really love that. And… well, I love all of it. My rewatches are usually of more light hearted and adventurous. Jaws, Indiana Jones. Shaun of the Dead. Scott Pilgrim vs.The World, Independence Day, Toy Story, Glory Daze, Ten Inch Hero, even The Breakfast Club. Most of these stem from nostalgia. But all of these are definitely rooted in my rewatchability category located someone in my noggin. Admittedly, I haven’t seen Glory Daze or Ten Inch Hero, but all the others absolutely have a high rewatchability factor. Shaun and Jaws are both movies that, if they’re on TV, I feel like I should watch at least a few minutes. I have to also add…and this is totally guilty pleasure here, Roadhouse. I don’t know why. It’s ridiculous Swayze fun. If I could only ever watch one movie for the rest of my life, this would be the one. That movie is awesome. Pure fun in every way. I’m really hoping that Ghostbusters 3 doesn’t get made, or in the very least- I hope it doesn’t get made unless Bill Murray signs off. He seems to want to protect the magic of the original. It’s actually been a while since I’ve rewatched movies because I haven’t been able to fit it into my schedule. Some of my most rewatched, though, are The Big Lebowski and the Evil Dead movies. Both great choices. Lebowski never fails to lift my spirits. It’s got a life of its own at this point (in a great way). Since last week I have seen the incredibles and ratatouille at least 6 times each. (1 and a half year old…) He can’t stand any of the cheesy princess movies! Yes! Ha… my friend who’s seen 2001 so many times has now seen Cars 2 an insane amount of times for that exact same reason. All awesome choices. I’m surprised I haven’t seen Raiders more than I have. When I was a kid, we wore out the VHS copies of all the Star Wars films, especially the original, and could quote most of the lines. For a while in the ’90s, my go-to film was Steve Martin’s LA Story. I still find it really funny, and I can’t help but smile while watching it. More recently, I haven’t re-watched as many movies due to time, but one exception is Serenity. I caught up with Firefly on DVD before seeing the movie in the theaters, and I fell in love with the characters on the show and the film. I’d bet there are a lot of people your age (my age too; I think we’re within a year of each other) who can say the same for Star Wars. Serenity is my drunk goto movie. No idea how many times I’ve seen this, or at least fallen asleep at 1am while trying to watch it due to large volumes of beer. Its a great film and a great way to finish off the Firefly storyline. Everyone I know who’s seen Serenity has loved the hell out of it. Typically, the movies we watch over and over again rarely win Best Picture. Animal House, Blues Brothers, and Caddyshack would make the list in the old-school 70s/80s comedy category. The Usual Suspects, Fight Club, Goodfellas, Casino, Raising Arizona, the Star Wars trilogy (IV, V, VI), Apocalypse Now are also on there. There are also great movies that I may never watch again–How many people rent Schindler’s List just for old time’s sake? Those 70s/80s comedies are the easiest thing in the world to watch. I own a bunch of DVDs and recently have been buying some Blu-Rays, but I will rarely re-watch a film by myself. (although I just bought and was re-watching Wages of Fear last night…) I have too many movies in my Netflix queue that I always want to get through. Dazed and Confused and Almost Famous are probably 1-2 for me. 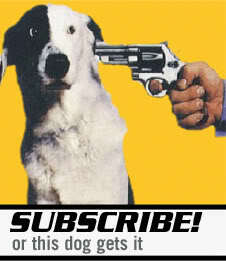 After that, anything from Tarantino. Oh, and The Room. Can’t get enough of that, especially when Tommy Wiseau keeps coming into town for Q&A screenings. Tarantino’s movies… I could watch all of them 100 times and still enjoy them. I have different categories of “re-watchable” movies. There’s the movies I rewatch because I love them (the shortlist includes Singin’ in the Rain, Almost Famous, Dirty Dancing, My Girl, and 16 Candles) and there’s the movies that I rewatch because of my undying love for particular actors/actresses (the entire canon of Michael Fassbender films, anything with Anne Hathaway, etc). I can definitely appreciate that. My parents have several Paul Newman movies they watch because of how highly they think of him. To me it’s The Shinning. I have to watch this every fall. And Christmas Vacation I have to watch it every year in the week before Christmas. Oh yeah… the holidays bring out a whole other batch of movies. Halloween is when I get my annual viewing of The Wolf Man out of the way. Christmas includes Christmas Vacation, Santa Claus Conquers the Martians, and the animated Grinch. My buddies usually joke about how many times I’ve seen Dazed And Confused, I lost count around 20 but I usually watch it 4-5 times a week, and then we have the Kevin Smith films Clerks, Mallrats and Chasing Amy, which I’ve seen far to many times. I’m with you completely on Clerks and Mallrats. Nothing against the others, either. I just happen to have seen the others more often. In the late 80’s I lived in a house with 5 of my best friends. We had 2 VCR’s and both of them had a copy of “Raising Arizona”. The VCR’s were always on and linked up so that when one tape would run out the other tape would start. At any hour of the day, “Raising Arizona” was just whirring away. We literally had to stop watching, “Raising Arizona” to watch TV. Someday I will tell you the dumb thing I said to Holly Hunter when I met her. To this day, Raising Arizona is my favorite Coen Brothers film. It’s not the best but it was the first one I ever saw when I was a kid. yup! i saw it in the theater when it came out and from then on it was Coen bros. love! It took me a long time to warm up to that one because I got in a lot of trouble with my parents for watching it (when I was 10) when my grandparents were around. I guess my Pentecostal grandparents weren’t so keen on the Coen brothers’ humor. Did they prefer, “Blood Simple”? I can watch The Blues Brothers over and over without ever getting tired of it. Not sure why. Caddyshack is also up there. I figure that even on the off chance that someone doesn’t like the plot and humor of the Blues Brothers, you can always enjoy the music. I recently got my grubby mits on the ‘directors cut’ of BB. I had no idea there was one, and there are some scenes which seem longer than others but overall the film is unharmed. Its a classic and I really loved rewatcherpiecing it again. Also, John, I think you have coined a new phrase there. I’m using it more and more. Ha… I’d have the hugest grin in the world if someone used that in a sentence to me without knowing where it came from. In my family, we’re big quoters, and my mom has a couple movies that she likes to put on when cleaning house. As a result, I can quote That Thing You Do 100% of the way through. Song lyrics included. I am not exaggerating at all. When I was 13, my sister and I stayed with some friends several times over a year or so, and our movie was the very silly, but still lovable Hairspray (recent version). I’m told we rented it over 20 times before we bought it. I lost count of how many times we watched it. While housesitting recently, I watched Walk The Line for the first time and proceeded to watch it 4 more times, IN ONE DAY. I still can’t really explain that one, except, I’m a Cash fan? I’ve finished a movie and started it right over more than once though. Sometimes you’re just not ready to leave that universe, or those characters. I just rewatched Sound Of Music (we’re big on music-related movies), which was my favorite movie when I was 4, and I’m seen that 3 hour movie probably upwards of 50 times in my life. And I wouldn’t be surprised at all if it were much more. Watching that was like visiting old friends. I love movies. “Like visiting old friends” is a really great way to put it. As a small child i watched the heck out of the animated Charlotte’s Web from the early 70’s. As a teen I watched Fight Club at least once a week for probably 6 months and then on a regular basis for quite sometime. I think I could watch The Fountain no matter what. I have seen it around a dozen times and haven’t gotten sick of it. But of late, I have a certain affection of the epic known simply as Rubber. Ha… Rubber is great. I told my brother about it, and that inspired him to check it out. That’s quite a feat, too, because it’s not quite the kind of movie he’d normally watch. He has diverse tastes but not quite that diverse. That filmmaker has another one coming out relatively soon. Both of those sound crazy in a really cool way. Oh, there are dozens of movies I’ve seen more than once, and will often go back to, like you said, depending on my mood and what I need to get out of it. There are movies that I watch purely for enjoyment (the Scream quadrilogy being one – or four, depending on your definition – although I’ve only actually seen the fourth installment once – in my opinion it doesn’t quite live up to the first three films). I watch Grease for the music, and to be able to sing along to all the songs. Strangely enough, I watch Twilight for the same reason (although I’m also a self-confessed Twiharder; I have all the books, DVDs and soundtracks, plus the Twilight boardgame and pc game), but the actual story in the first installment doesn’t grab me the way it did the first few times I watched it (unlike the ensuing installments), it’s the way the music fits the story so well, and how it makes me feel every time I watch it, especially the opening sequence. There aren’t many movies that can take me back to a specific scene, or to the way I felt the first time I watched the movie the way that Twilight can. And then of course, I’ve seen New Moon, Eclipse and Breaking Dawn (part 1) a fair few times too. I totally buy into the love story between Bella and Edward, and I’m team-Edward all the way (although, I do love to see Taylor Lautner take off his shirt). I watch the Harry Potter series for the sheer enjoyment of the magic, the sense of wonder the music brings out in me (what gorgeous music), and because watching the movies are faster than reading the books. I love the Harry Potter series, and again, I have all the books and the DVDs, as well as some merchandise. I could watch the movies over and over again, and in fact, I have! I’ve even used the movies as background “music” to listen to while I work! I have also watched Titanic quite a few times since it’s first release. I’m totally captured by the history of the original event. It fascinates me. And to be able to live out that obsession as well as being entertained by a beautiful love story is incredible. Every time I start watching the movie, hear the orchestral music start up, and watch the ship come to life, it makes me feel something I can’t describe. A sense of wonder perhaps? Who knows. But whatever the reason, I love the movie, and I’m planning on going to see it on the big screen again, this time in 3D. Avatar is another epic movie that I’ve seen more than once. No matter what anyone says about it, I love the movie. The visual effects, the characters, the storyline, the beautiful backdrop, all come together for a thoroughly enjoyable experience for me. And then lastly (that I can think of off the top of my head) is Eat Pray Love. I watched that movie every night for a week when I first got it, and I’ve probably seen it at least another 7 times since. When I feel low, or in need of some spiritual uplifting, I turn to that movie. I’ve read the book and I’ve got the soundtrack, and it’s also one of those rare movies where just hearing the music can take me back to a specific scene, and how I feel when watching it. My favourite parts are Italy, and Bali. Italy, because of the music, the friends she makes, the food, the language, and how she becomes comfortable with who she is. And Bali because of the music, the beauty of the place, and Javier Bardem (ooh la la). The movie lifts me up, inspires me, rejuvenates me, and I have to watch it (preferrably) with a glass of red wine, and some Italian food. It’s just that kind of movie. It involves ALL of your senses.